A late change to the entry list for the Nurburgring 1000 Km this weekend sees Marc Duez replace Romain Iannetta, in the Gordon Team Porsche – writes Joost Custers. "The collaboration with Marc is something I look forward to," says fellow driver Yves Lambert.. "He is experienced and knows both the track and the car. It will certainly mean a gain for the team. We'll try to score some good points and finish within the top six." 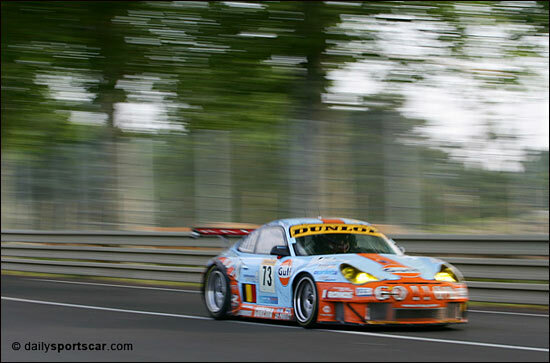 That’s exactly what the Gordon Team car managed at Le Mans – sixth place in GT2 (below). The Gordon Team / Ice Pol Porsche will also be racing at the Spa 24 Hours later this month, but Duez has other commitments for that event – he’s racing the new BMW Z4M for Duller Motorsport, with Dirk Werner, Dieter Quester and Fred Bouvy.